Feeling confused about what to eat for a healthy pregnancy? Want to ensure that you are doing everything you can to grow a healthy baby? Have you heard that following a real food for pregnancy diet can help? We all want the best for our babies. But who has the time to dive down the Google rabbit hole and do the actual research to find out what really is best to eat for growing a healthy baby? Doesn’t it seem like there is a lot of conflicting pregnancy diet information out there? It can be so frustrating trying to figure out the right things when you just want to eat already! 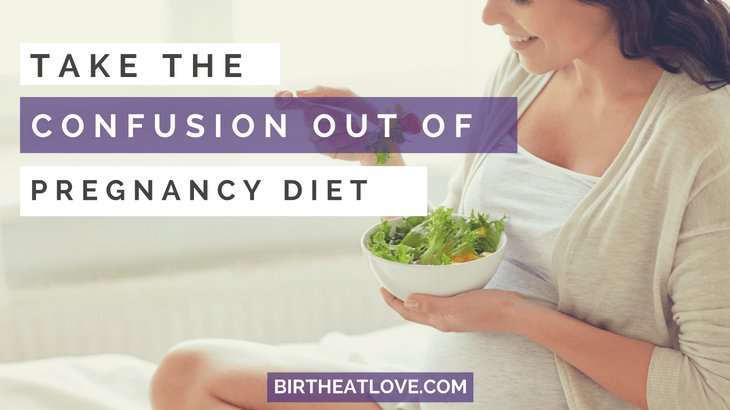 Why can’t there just be clear answers as to what to eat during pregnancy? As a Mama of 4, I spent so much time researching pregnancy nutrition, yet feeling continuously confused. It’s difficult to feel confident about your choices when there is so much conflicting information floating around about what to eat! 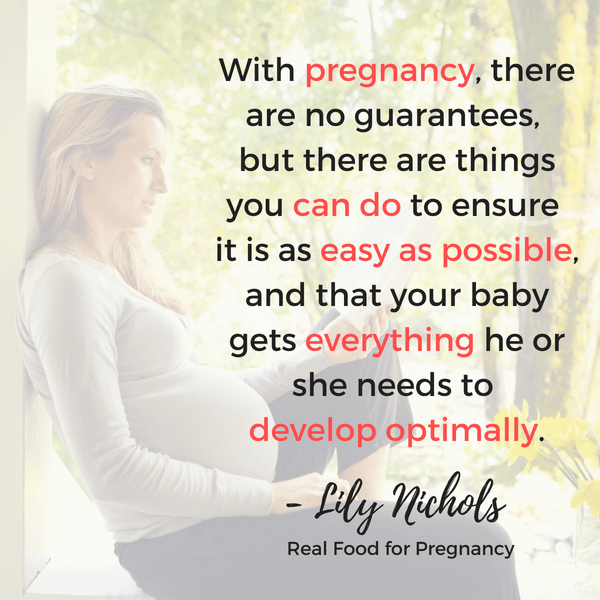 Luckily for all of us, the best selling author, mother and Registered Dietitian/Nutritionist Lily Nichols has written the definitive guide to pregnancy nutrition! Full Disclosure: I was given a copy of Real Food for Pregnancy to review. All opinions shared are my 100% my own. Some links are affiliate links. Read more here. Mamas, I can not tell you how exciting it is to discover Lily’s book Real Food for Pregnancy and share it with you! My first impression was that the book was just a cookbook. But, boy oh boy was I pleasantly surprised. For years, I searched for information that confirmed the bits and pieces of what I’d found through personal experience and research to be true. I spent hours reading blogs like Wellness Mama, Mommypotomus, Nourished Kitchen, Mama Natural, Traditional Cooking School and many more. I delved into researching Weston A. Price and Nourishing Traditions. Mostly because I knew deep down, like you probably do, that when you are pregnant, what you eat matters. In her book, Real Food for Pregnancy, Lily lays out exactly what you need to know to grow a healthy baby and have a healthy pregnancy. She breaks down the myths about what you should and shouldn’t eat with meticulously researched footnotes. No searching all over the place and piecing it all together like I had to do. Lily has done the hard work for pregnant mamas! Everything you would ever want to know about pregnancy diet is included in this book. Seriously. The best part is that she does it in plain language. You feel like you’re having a conversation over tea with a girlfriend, rather than reading a dense medical textbook. If you have been feeling confused about what to eat? This book is a must read book for you. Want research back information to base your pregnancy decisions on? This book is for you. Want the best for your baby? This book is for you! First time mom? Birth worker, doula or midwife? This is a must have book to add to your personal library because you will be referring to it over and over again! 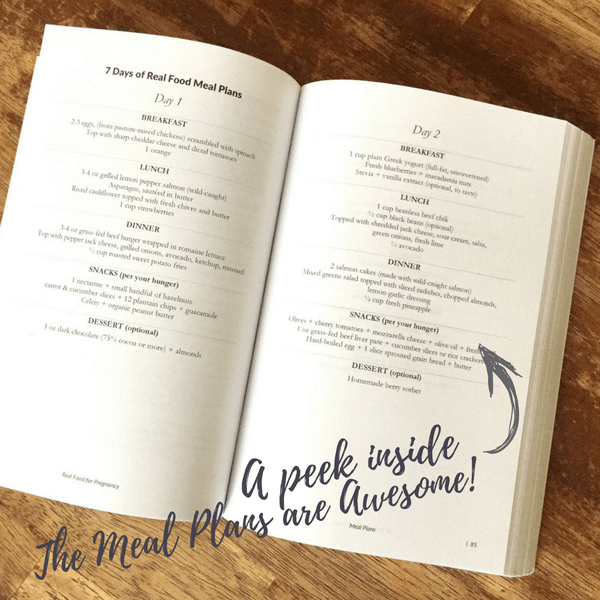 There is so much essential pregnancy nutrition wisdom shared in this book! The book focuses mainly on pregnancy diet, but also takes a holistic approach to pregnancy and includes chapters on stress management, exercise, and postpartum, as well. What foods you really should avoid during pregnancy- it’s not what you’ve been told! The key lab tests needed during pregnancy – this is so interesting and something I WISH I would have known about as a first time mom! I love Lily’s writing style. It’s conversational and to the point. There’s so much valuable information packed into this book, but it broken down really well and is easy to consume. I’ve read less than 5 books in the last 5 years (I’m more of an audio book person, LOL) and I found this to be an easy read. One great thing that separates Real Food for Pregnancy from other pregnancy diet information I’ve come across is that rather than list a bunch of vitamins and daily values, Lily breaks down for you the best foods to eat. She tells you what you need to know so that you can make good decisions in a very mindful way. If science backed pregnancy research is your thing, there are over 930 footnotes in this book! That’s 33 pages of citations. I don’t think I’ve ever come across a pregnancy book so well cited. If you are a research nerd this book is going to knock your socks off. During pregnancy we all want to make sure we aren’t doing anything that could harm our unborn baby. Knowing what foods are and aren’t safe based on the actual research can really put your mind at ease. This book isn’t just medical data, theory and research. It is a very practical guide to eating during pregnancy. It has a 7 day pregnancy meal plan with recipes for breakfast, lunch, dinner, snacks and dessert. Plus 27 recipes featuring real food! It shows you how to apply the eating principles that are outlined. Which makes it so much easier to see how eating real food during pregnancy is possible for you. A few of the recipes from the book that I’m eyeing are the Crustless Spinach Quiche and the Grass-fed Meatloaf featuring liver! She also has a Electrolyte Replenishment Drink that sounds awesome. And the Grain free Granola is to die for! Check out my Instagram post featuring it here. Lily suggests many nutrient dense foods that can help nourish your body during pregnancy. 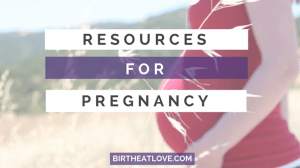 I love that her suggestions are aligned with what I’ve learned and practiced during my pregnancies. If you’ve read my Nourishing Your Pregnant Body Series, you will recognize A LOT of the same foods mentioned. Liver is mentioned several times and there are a few recipes featuring it! I personally found eating liver really boosted my energy during pregnancy and postpartum. It also helped boost my milk supply. But, it’s rarely (if ever) mentioned in conventional pregnancy diet recommendations. So I was super excited to see that one included. Kombucha, fermented foods, and red raspberry leaf tea (3 more of my favorites) are also mentioned as beneficial foods to eat during pregnancy! I found kombucha particularly helpful for relieving morning sickness. But again, it is one of those foods often listed in the “consult your caregiver” category. Lily also takes an very enlightened approach to foods we’ve all been told to avoid during pregnancy like sushi and soft cheese. She explains in detail the nuances to making intelligent food decisions while pregnant. This is something I have NEVER come across before in diet info aimed at pregnant moms. The norm seems to talk to pregnant women like they are incapable of understanding how to make wise decisions. So a BIG kudos to Lily for really digging into this topic. Real Food for Pregnancy is not just a big summary of essential nutrients and why they are great like so many of the healthy pregnancy diet posts you come across on the internet. For each suggestion, I love how Lily offers something specific you can do to incorporate the advice. Foods are suggested to address common pregnancy complaints like nausea, heartburn, constipation and high blood sugar. Special considerations are given to food combinations and timing so that you can relieve symptoms. 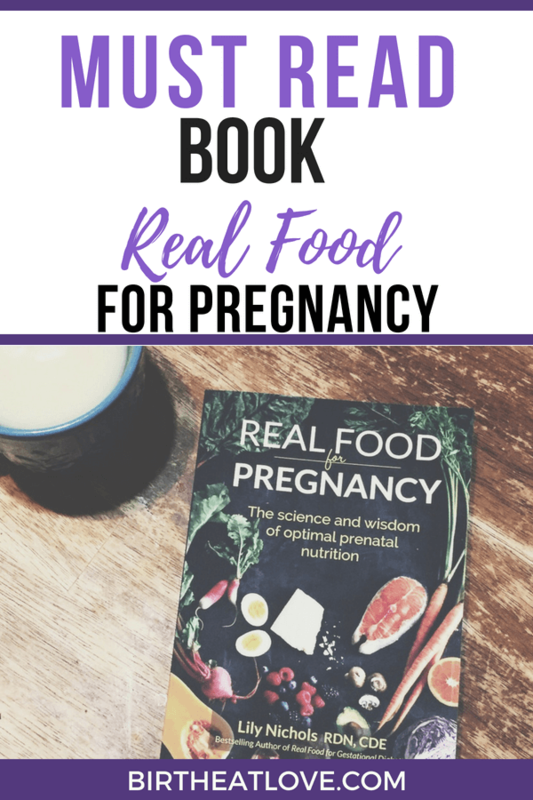 This is what I think really makes this book stand out from other pregnancy nutrition books. It’s research meets actionable advice which makes it doable. So many pregnancy books stop at birth. As if, there is nothing more new moms need to know. Lily sheds light on how to care for yourself in the first months postpartum, or the “4th Trimester”. She explains the importance of a more traditional approach to postpartum recovery and outlines some basic self care practices for moms. I really like how she emphasizes rest, warming foods and the role food plays in supporting breastfeeding and healing. Focusing on healing foods was something that really helped me recover fast and well from the birth of my 4th baby. There is also research showing that eating a real food diet can help prevent postpartum depression. This is knowledge that ALL moms need to know before having a baby. So many of the big questions about pregnancy nutrition are answered in this book. Can you eat sushi while pregnant? Which herbs are safe? Can you drink kombucha? How much weight should you gain? All these questions and more are answered in Real Food for Pregnancy. Lily shares the research to back her answers, but also an enlightened approach for wading through these often controversial topics. If you’d like to learn more about Lily check out her awesome Instagram Feed or on her blog where she shares really detailed nutrition briefs for pregnant Moms. The information that Lily shares in Real Food Pregnancy is vital for every pregnant mom to know. Optimizing food choices can help you avoid many pregnancy discomforts. Pregnancy diet also plays a vital role in the development of the fetus, and also in your child’s overall long term health. That’s why it’s sooo important to eat the best you can while pregnant. This book will help you do that! Order your copy of Real Food for Pregnancy on Amazon here! Make sure to Pin this Post for later!! Ever wonder what a nutritionist thinks about weight gain during pregnancy and if you have to eat all organic to be healthy? Read this Q & A with Lily Nichols to learn more about pregnancy nutrition. Looking for healthy dinner recipes? In this post, we poured through countless recipes to make a list of the Superfood pregnancy dinner recipes that are all quick and easy. Finding snacks during pregnancy that are actually good for you and taste great can be a challenge. This post contains over 50 healthy snack ideas that you can try today! Want more healthy pregnancy advice? Sign up for email updates below! Plus get your FREE download on 17 Foods to Nourish Your Pregnant Body! Healthy Eating advice, childbirth preparation, healthy eating, meal planning, pregnancy, pregnancy diet, pregnancy food, pregnancy tips. permalink.